Long-term weight loss can be achieved through a combination of diet, increased physical activity, behavioral modification and pharmacological treatment. However, weight regain is very common. Wing and Phelan (2005) estimate that only about 20% of overweight and obese individuals are able to maintain a 10% reduction in body weight for one year. Picot and Jones et al. (2009) evaluated 3 randomized controlled trials and three cohort studies for the effectiveness of weight loss surgery versus non-surgical intervention. They found that weight loss "surgery is a more effective intervention for weight loss than non-surgical options. Surgery led to a greater reduction in weight in all six studies and the difference was statistically significant in five studies reporting a statistical comparison". One of the studies reported "a statistically significant reduction in the incidence of three out of six comorbidities assessed at 10 years follow-up after surgery compared with conventional therapy". Picot and Jones et al. (2009) also investigated the efficacy of various surgical options. They found that gastric bypass (GBP) is more effective for long term weight loss than either vertical banded gastroplasty (VBG) or adjustable gastric banding (AGB). There are three basic categories of weight loss surgery (WLS): restrictive, malabsorptive and combinations of restrictive and malabsorptive surgeries. Restrictive procedures limit the intake of food by reducing the size of the stomach and therefore the amount of food that it can accept at each feeding. Malabsorptive surgeries limit the absorption of nutrients by changing the path of food through the alimentary tract. 90% of stomach is bypassed; the lower compartment still produces necessary digestive juices and drains into small intestines which receives food from the gastric pouch. Access port placed under the skin, just below the rib (50 cm kink resistant tube). 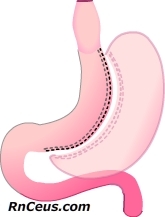 Surgical staples and nonreversible resection reduce the stomach volume to 60-80 cc. Eliminates stomach tissue that produces ghrelin, a hunger inducing hormone. The pylorus is preserved which eliminates "dumping syndrome". Eliminates malabsorption because the food does not bypass the duodenum or portions of the jejunum. Motivated and well informed patients that are free of significant psychological disease. persons beyond the age of 60 years. Each health care institutions will set it's own patient selection criteria. Medical professionals need to familiarize themselves with the policies and procedures that govern their practice in order to provide safe and effective care. Birkmeyer; Dimick, et al. (2009) published evidence indicating that the risk of WLS complications was inversely associated with procedure volume. They also found that Center of Excellence accreditation alone did not insure a lower complication rate. Murr; Martin et al. (2003) found that for gastric bypass, the complication rate was inversely associated with hospital and surgeon procedure volume. Treatment of obesity is a life long challenge, institutions that provide weight loss surgical services should be prepared to provide multidisciplinary services in both the inpatient and outpatient settings. WLS patients travel throughout hospitals for tests and procedures; there should be size-appropriate accommodations in all inpatient and outpatient points of service. These should include chairs and bathroom facilities, transferring equipment (stretchers and wheelchairs), and monitoring equipment. A comprehensive ergonomics program, including: back safety, lifting, patient care and transferring equipment should be implemented to prevent staff and patient injuries. Treatment team - The complex etiology and comorbidities associated with obesity require a multidisciplinary approach to treatment. A team led by a qualified surgeon and including nutritionists, psychologists and nursing staff with specific training and experience, and medical subspecialists (endocrinologists, anesthesiologists, radiologists, pulmonologists, gastroenterologists, etc.) can help to insure optimal treatment outcome. Nutrition - WLS, especially malabsorptive procedures, can cause multiple micronutrient deficiencies. Patients should be monitored pre- and postoperatively for deficiencies in vitamin D, thiamine, calcium, iron, vitamin B12, and folic acid. Physical activity - WLS patients should be encouraged to increase pre and postoperative physical activity with low-to-moderate intensity exercise. Guidance and periodic monitoring should be used to help WLS patients remain physically active. Pregnancy testing - WLS should not be performed in patients who are known to be pregnant; women of childbearing age should be pregnancy tested preoperatively. Patients should be strongly counseled to not get pregnant for at least 18 months after surgery. Psychological evaluation is an integral part of patient selection for WLS. Abiles; Rodriguez-Ruiz; et al. (2010) found that obese patients had higher levels of stress, anxiety, depression, food craving, and eating behavior disorder symptoms and lower levels of self-esteem and quality of life compared with normal-weight volunteers. Psychosocial factors can affect the patient's ability to achieve expected weight loss from WLS. Addressing psychosocial factors may facilitate patient selection and appropriate interventions. The psychological evaluation should be performed by a social worker, psychologist, or psychiatrist capable of testing and evaluating psychological factors that may effect the long term success of WLS. It should be noted that the presence of psychological disorder is not an immediate contraindication to WLS. Perioperative Education allows the patient to make informed decisions regarding the risks and benefits of a specific surgical procedure and the ongoing treatment plan. Education helps balance post-op expectations with the lifestyle changes necessary to improve the quality of life. Higher BMI and associated medical comorbidities (e.g., obstructive sleep apnea and coronary heart disease risk factors, Type II Diabetes, Chronic Renal disease) increase operative risk and postoperative complications. Patients with a history of CAD should receive preoperative assessment of cardiovascular conditions as indicated. Those with stable or suspected CAD should receive perioperative beta blockade unless contraindicated. Patients with known or suspected liver disease should be evaluated to assess severity of cirrhosis and/or portal hypertension. Intraoperative liver biopsy at the time of surgery may be useful for diagnosis and assessment of liver disease. WLS is not recommended in patients with Child's Class C cirrhosis. Risk of DVT/PE has been identified by Singh; Podolsky; et al. to occur in about 1% of gastric bypass surgeries. Patients should also be considered for preoperative and extended post operative prophylaxis including anticoagulants, sequential compression devices and early ambulation. Obesity decreases tissue oxygen tension at the incision site, the oxidative killing capacity of neutrophils is dependant upon adequate tissue oxygen tension. Obese patients are at increased risk for decreased serum and tissue concentrations of prophylactic antibiotics. Obese patients are at increased risk for preoperative hyperglycemia. CBC, Comprehensive Metabolic Panel, Urinalysis, Blood typing, Chest X-ray, Electrocardiogram, Pulmonary function, Serum fat-soluble vitamins, Screen for Heliobacter pylori (peptic ulcer is a surgical contraindication), Ultrasound for cholelithiasis, UGI for symptomatic patients, Polysomnography may be ordered for patients with obstructive sleep apnea (OSA) or hypercapnia. Comorbidities: diabetes, hypertension, cardiac disease, OSA, osteoarthritis, GERD, depression, stress incontinence, liver disease, venous stasis, lymphedema, etc. Safety of the patient and staff is primary. Specialized nursing teams familiar with the surgical equipment and procedures for the safe transport, positioning and support required during WLS may provide the best outcomes. 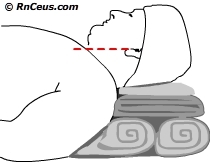 Ramp position aligns the patient’s auditory canal with the sternal notch. All aspects of the surgical environment must be adapted to the needs of the obese patient. Automated OR table, capable of ≥30 degree reverse Trendelenburg and safely accommodate the weight and width of the patient. Induction/intubation may require custom bolsters or special positioning equipment to place the patient in the "Ramp" position. Obese patients can desaturate quickly due to reduced functional respiratory capacity from the extra weight on the chest wall and increased visceral pressure against the diaphragm. Obesity increases the risk of pressure ulcers and friction/shear injury in the perioperative period. Attention to transfers, OR table padding and contact surfaces is essential. Special focus on high risk areas include: buttocks, heels, sacrum, occiput, skin fold areas including skin to skin areas and thigh folds. Post-op transfer of the patient from the OR table to a properly sized hospital bed can reduce the number of transfers. An appropriate sized CPR backboard, biphasic defibrillator and emergency airway equipment should be immediately available. Airway management is a key component of the acute recovery period. Post-op pain management is an important quality of care indicator that can affect surgical outcomes. The goal of post-op pain management is: early ambulation, deep breathing and coughing to avoid the common complications of atelectasis and venous thromboembolism. Gastrointestinal leaks from staple line defects or inadvertent bowel puncture are life threatening complication of weight loss surgery. Unstable vital signs including persistent or progressive tachycardia within 72 hours of surgery should raise concern. GI contrast may not identify leaks. Gastrointestinal bleeding presenting as melena or rectal bleeding in <48 hours may indicate staple line hemorrhage, bleeding >48 hours may indicate a marginal ulcer. Obstruction usually presents as abdominal pain with vomiting lasting more than 4 hours. If obstruction is suspected, blind insertion of an NG tube should not be attempted. Imaging with contrast is likely. Patients with obstruction are at increased risk of aspiration. Gallstones occur in about 70% of patients that lose weight rapidly. The majority of weight loss occurs in the first year following surgery and it is that period which has the highest risk for stone development. Dumping Syndrome occurs in about 10% of all gastric surgeries but more commonly in combined procedures. 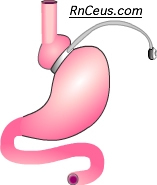 "Gastric emptying is under control by fundic tone, antropyloric mechanism, and duodenal feedback, regulated by the enteric nervous system and circulating GI hormones. "* There are two types of dumping syndrome 1) Early dumping (30-60 min after eating) is the rapid release of gastric contents into the small bowel resulting in nausea, crampy pain, and diarrhea; 2) Late dumping symptoms of fatigue, weakness, flushing, shakiness, dizziness, confusion, etc., occur about an hour or more following high carbohydrate intake and results from hyperinsulinemia. Vitamin and Mineral Deficiencies occur more commonly with combined restrictive and malabsorptive operations. The most common reported deficiencies are: iron, vitamin B12, vitamin D, and calcium. Vomiting is a common following weight loss surgery and may be severe enough to cause dehydration and electrolytic imbalances. Promethazine or ondansetron are first line treatments along with rehydration and electrolyte replacement.